Whispers in the Loggia: Nuncio's Norm #1: "Be Young"
Sure, that tends to mean more work for your narrator. Then again, as Sambi's speeches tend to have a key nugget of insight -- or several -- just below the surface (or sometimes, not below the surface at all), they're actually a worthwhile joy to mine and transcribe. 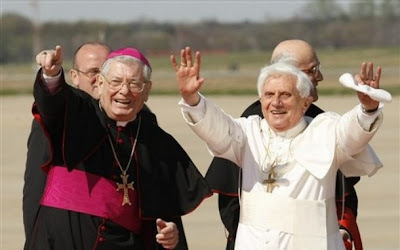 In that light, while the archbishop (who won over both Jews and Palestinians during his seven years as papal legate to Jerusalem) quoted extensively from B16's April address to the USCCB in his own words to the body on Monday morning -- seemingly not because, as some folks guessed, he was "unprepared"... but simply that the bench might hear it again -- the first part of the talk drew from another, just as rich source: the last part of Vatican II's closing message, directed to the young of the church. Sambi's inference: the church -- the church in the United States -- must always resonate with the spirit of youth. And, with that, there's no better way to bring down the curtain on what's been quite the week.